Roy completes Allen’s comeback to defeat Tulsa 4-3 just over a minute into the extra period. 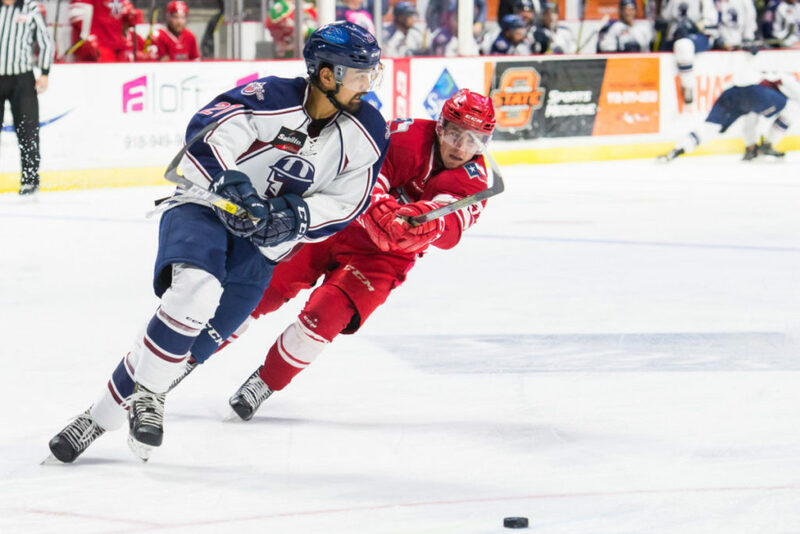 TULSA, OK – The Allen Americans came back to defeat the Tulsa Oilers 4-3 in overtime Sunday in a physical second meeting of the season between the two Western Conference rivals at the BOK Center. Garrett Ladd broke a scoreless tie 6:42 into the game when he stole the puck from a Allen defenseman and ripped a shot past goaltender Riley Gill as he was being checked. Tulsa made it 2-0, when Danick Gauthier picked the pocket of another Americans defender and beat Gill with a backhander on a breakaway for his first Oilers goal. Jamie Phillips stopped all 17 Allen shots in the opening frame. The Americans cut Tulsa’s lead in half when Chad Costello converted on a rebound attempt off of a transition rush at 6:58 of the second period. Tulsa appeared to have scored a power play goal shortly after to open its lead back up to two, but the goal was taken off the board as the net was ruled off before the puck crossed the goal line after a lengthy deliberation. On a separate Oilers power play late in the stanza, Dyson Stevenson tied the game short-handed for the Americans when he threw a shot off of Phillips and into the net. Defenseman Dennis Brown put the Oilers back in front early in the third period when he followed up a 2-on-1 rush and fired the rebound in from the slot for his first goal of the season. But again, Allen had an answer. Travis Brown centered a pass from the left wing off of Jake Marchment’s skate and in to tie the score at 3-3 and force overtime. In the extra period, Eric Roy was left alone on an Allen rush and snapped the game-winner over Phillips’ blocker into the top corner to give the Americans the comeback win. Next week, the Oilers travel to Wichita for two games Wednesday and Friday nights sandwiching Thanksgiving. Both games at INTRUST Bank Arena are 7:05pm scheduled starts and can be heard on www.tulsaoilers.com or ECHL.TV, with coverage beginning at 6:50pm. Then, Tulsa returns home to face the Thunder Saturday at 7:05pm at the BOK Center. The Oilers will wear special Winnipeg Jets Affiliation themed jerseys which will be auctioned off after the game.